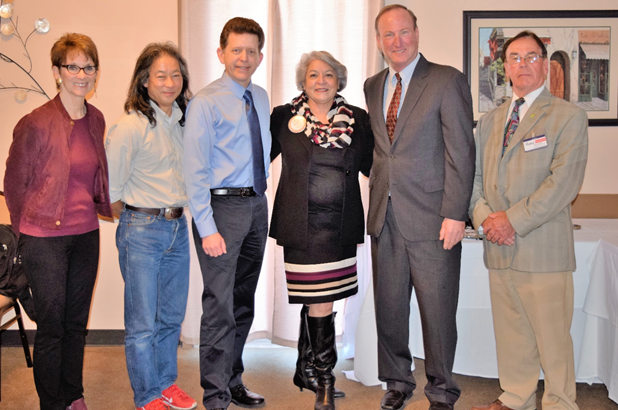 At today’s meeting, the Club hosted the four candidates for the Castro Valley Sanitary District (CV SAN) Board. Each candidate outlined his qualifications to serve on the board, the issues facing CV SAN and his vision for the future of CV SAN. This presentation was part of the Club’s ongoing efforts to engage the community and keep the members and guests informed on issues critical to Castro Valley. Club members had the opportunity to ask questions about the increase in rates and the construction of a new office. On October 25th, the Club will be hosting the five candidates for the Castro Valley Unified School District Board for similar informative presentation. Upcoming speakers are posted on the Club’s website. President Carol announced that the Gala scheduled for October 22nd has been canceled due to the lack of ticket sales. The Club is approximately $20,000 short of its $225,000 goal to fund an oxygen generator in Nejo, Ethiopia. Donations and sponsors are still needed to make our goal by December 31, 2016. Please make your donation in any amount by going to the Club website. Checks should include full name and address plus District 5170 501 (c) 3 94-3016176 in the note section receive the receipt from the District for tax purposes. Please share this humanitarian project with friends and colleagues. Every dollar makes a difference. Obse will be sharing the project at the District 5170 Avenues of Service Conference on Saturday, October 22, in San Jose. The District Avenues of Service Conference will be held at the Double Tree Hotel in San Jose on October 22nd. The conference is an excellent opportunity to learn more about Rotary International and District 5170 and how we can integrate their efforts into our Club. At least seven Club members are planning to attend. Attendance meets a Red Badge requirement. President-Elect Jim Negri reviewed the new system in ClubRunner to RSVP for lunch meetings to ensure that there is sufficient seating and food for each meeting, especially when there is a high interest lunch program. Watch of an email from Jim with more details. Even if you do not RSVP, please attend meetings and invite a guest.